Thanks to Instagram, I am now documenting everything down to the last insignificant moment of my day. I baked muffins? Photo! New shoes? Photo! Cute kitty pose? Photo! Project in the house? Photo! 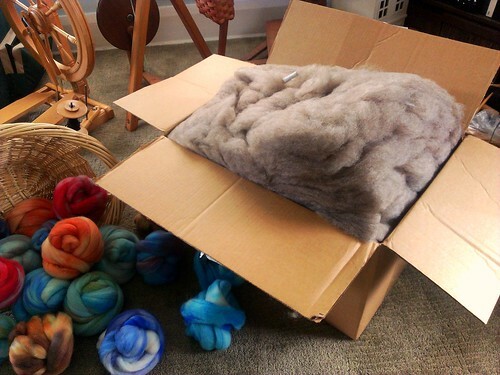 Spinning yarn? Photo! It may get a little dull sometimes, but the up side is that when I am in the midst of a knitting project, there are many more process shots. 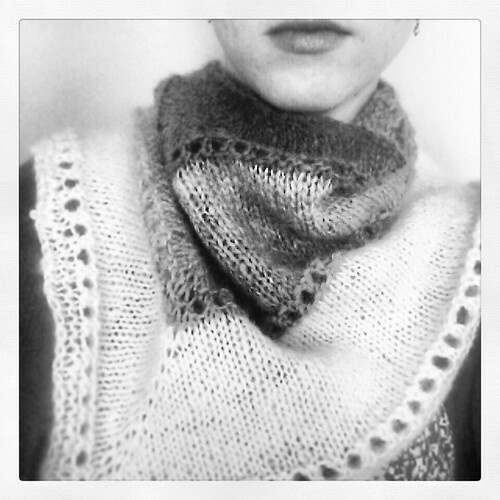 I finally finished the Age of Brass & Steam Kerchief using approximately 250 yards of handspun Shetland wool and size 8 needles. 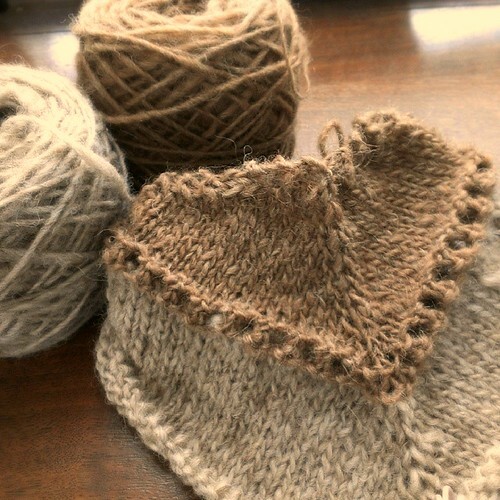 For each section I used a different color of yarn. The pattern was so easy and quick. 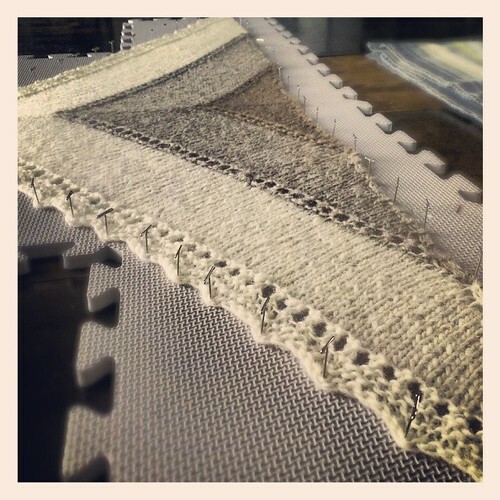 Although my measurements didn’t come out quite as the pattern suggested, it’s much wider than any other shawl/kerchief I’ve made. I didn’t make any adjustments, just followed the instructions as is. Today seemed like a good day to do a bit of spring cleaning, which basically consisted of “washing” all the windows. 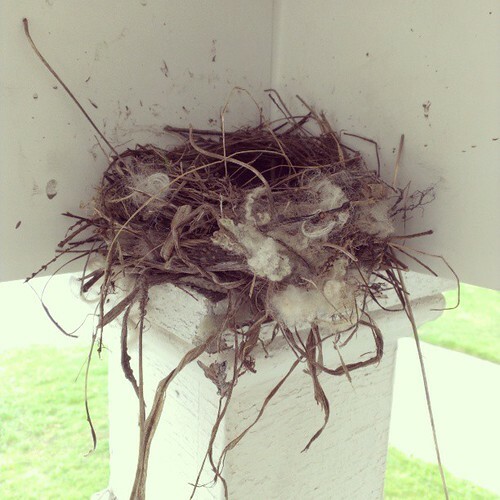 I put the blinds up on the front window, something I haven’t done for months, looked out, and saw a bird’s nest on top of the pillar under the porch roof. It surprised me! It shouldn’t have though, since I hear birds out there all the time. The best part is that they used some of the wool I stuck in the bushes. I left it there for them, so I’m glad they put it to use. Happy first day of October everyone! Is it really here already? On Saturday Ross Alpaca Ranch had an open house for the National Alpaca Farm Days. 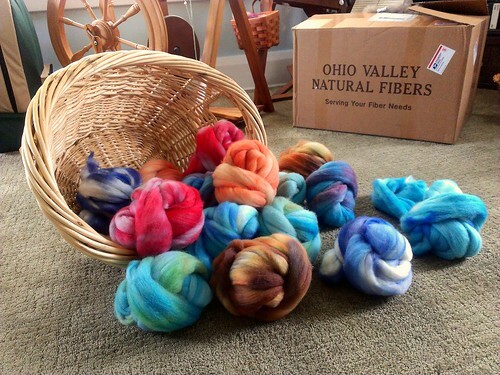 I spent the day spinning and talking to the visitors. I got pictures of my sample table, but when I went out to get pictures of the animals, my camera died. Immediately. So I have nothing else to show. No photos of the angora goats, the ducks, the alpacas, or the llamas. Nothing. Today I picked up three bushel baskets from Hobby Lobby. 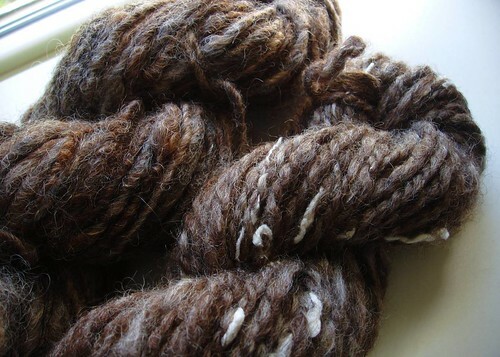 In the spirit of going “natural”, I will soon be offering undyed locks to go along with the undyed yarn. 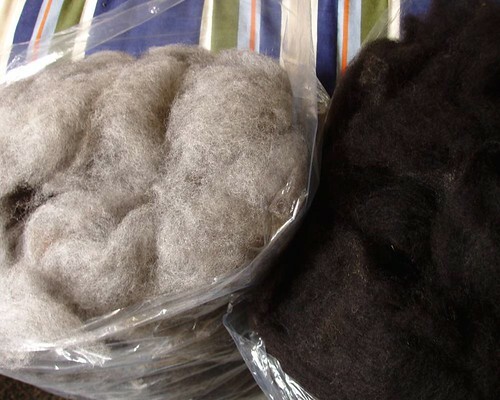 I decided that instead of bagging it for you, I’ll put the whole fleece in a big basket and you can buy as much of it as you want. For $2/ounce. 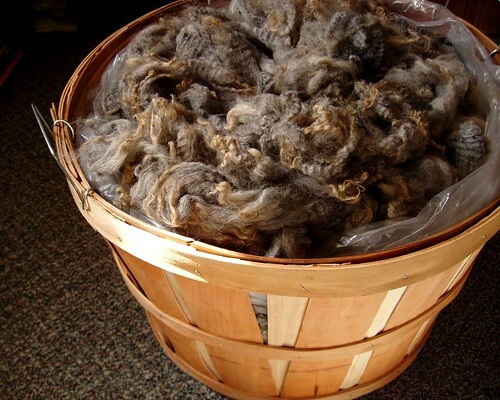 I tossed this Romney lamb fleece in one basket to see how it worked. Seems to work fine, wouldn’t you say? And this time it’s super bulky. Three monster skeins totaling about 26 ounces. 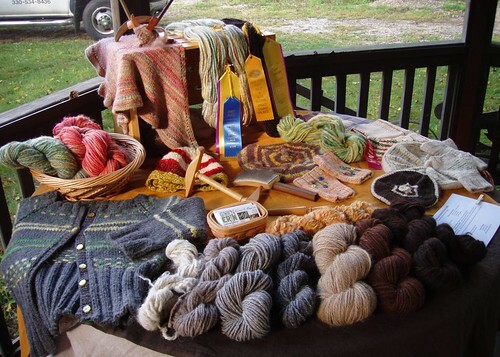 It’s kind of funny when I think about how many things I use and make but do not sell. 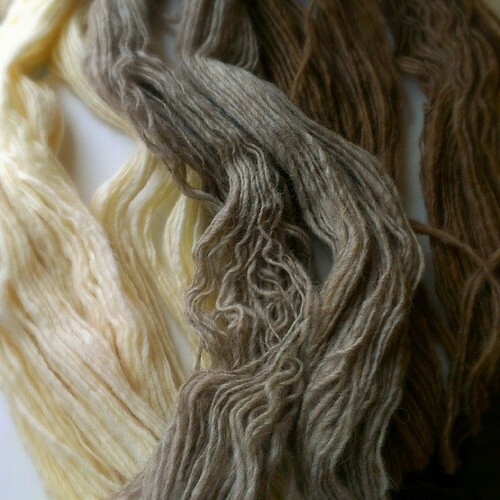 For instance, undyed yarn and fiber. 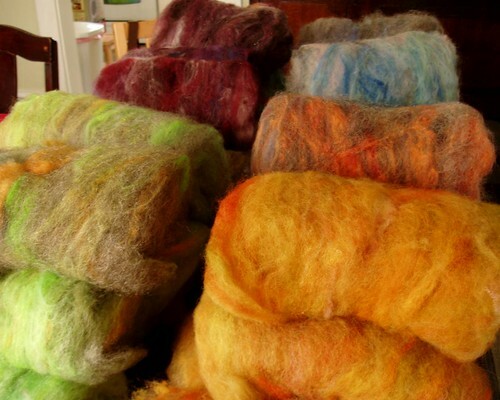 I love spinning the natural colors and I use the yarn quite regularly. 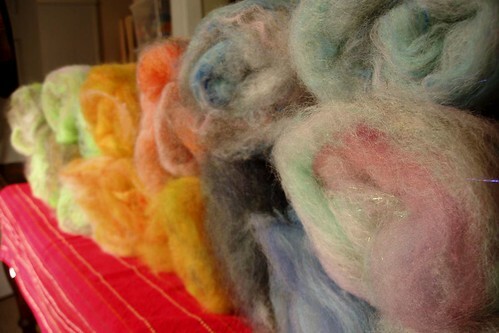 In fact, many of my mittens consist of a dyed yarn combined with a natural colored yarn, so I’ve got lots of it around. However, I never thought that anyone else might want it. 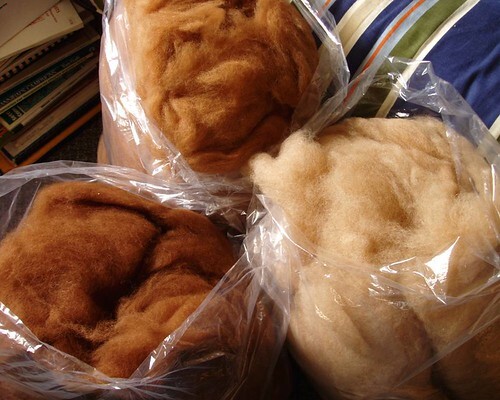 I’ve only sold brightly colored yarns, but maybe someone out there might really love a chocolate brown or a silver grey. Why not? 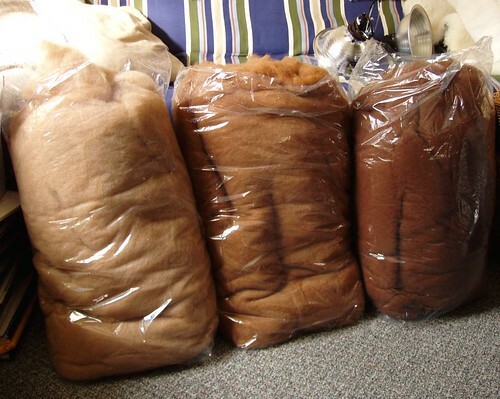 I’ve literally got bags of the stuff waiting to be spun. And it would be one less step for me, not having to dye it. I think I will start with these two skeins I found in my personal stash. The one in the upper left corner is new from this summer. It’s a Romney/Coopworth X singles. 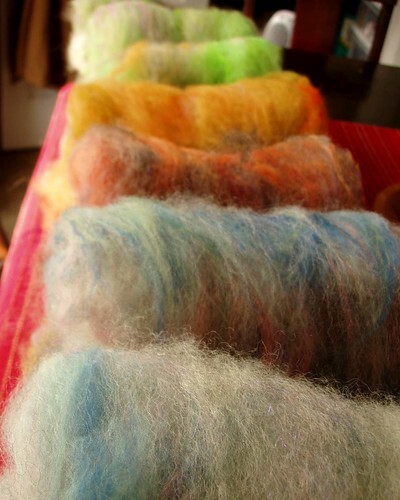 In the lower right corner is a 2-ply BFL/Border Leicester X with silk noils. That one has been hanging around since 2007. Maybe it’s time to find it a new home.